Open to the sensuality of daring red roses blended with refreshing vivid orange layered with an unexpected, champagne-like nutmeg. This sensual and euphoric aroma enhances feelings of romance and positivity. It stirs desire and gives a sense of passion. Leave the body incredibly hydrated, softer and smoother. Sensual Rose is a blend with pure orange, rose, and nutmeg with certified organic almond oil, argan oil, rosehip oil, and sunflower oil. These are non-comedogenic and non-clogging plant oils suitable for all skin types, even sensitive skin. 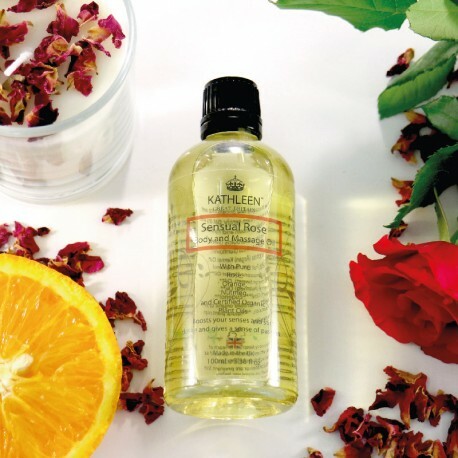 Leave the body incredibly hydrated, softer, and smoother with a non-greasy residue, providing a sensual and euphoric aroma that boosts the senses and enhances the feelings of joy, romance, and positivity. It will stir desire and give a sense of passion. 100% Natural. 97% certified organic ingredients. Suitable for sensitive skin. Vegan-friendly. Apply a few drops into the palm of your hand, inhale the scents and massage into wet skin immediately after a bath or shower, then gently pat dry with a towel. 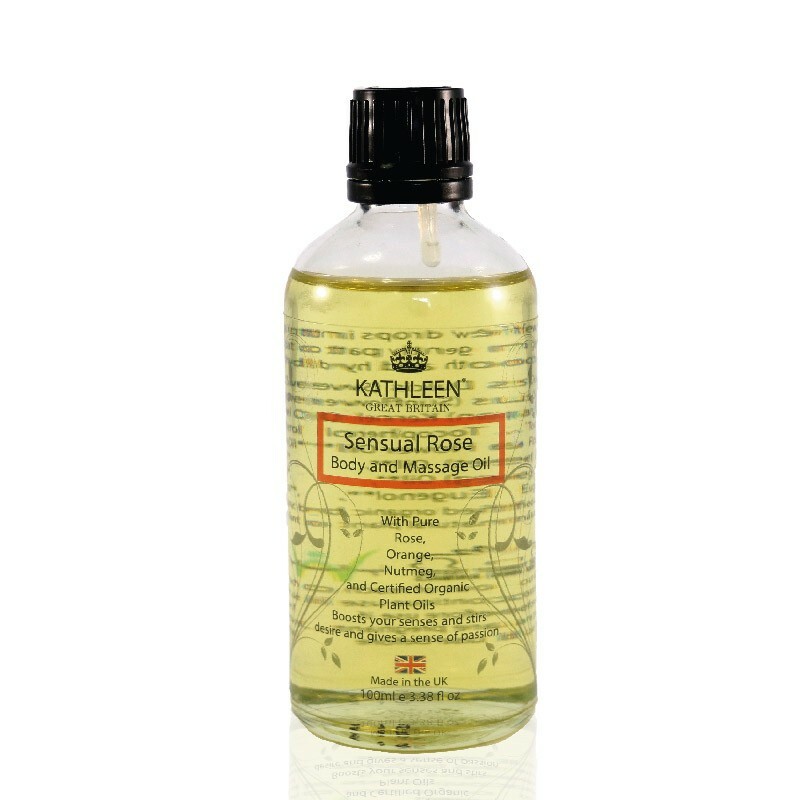 The oils lock moisture into the skin when the pores are opened after a bath or shower, and the nutrients from the oils penetrate into the skin quickly and deeply. These skin treatments are one of life’s little luxuries; use them often to give the skin a radiant, healthy look. 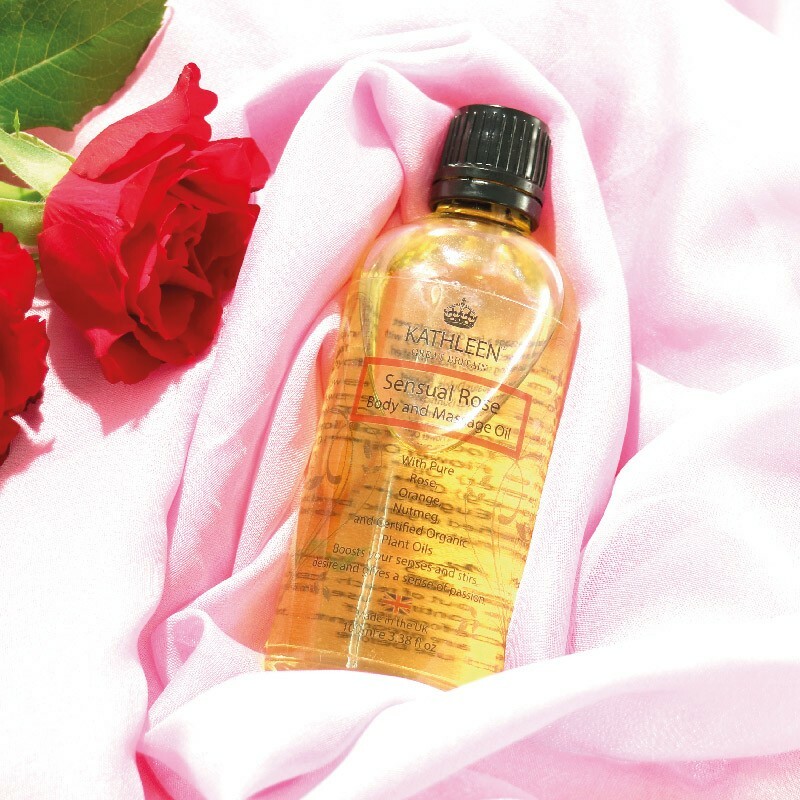 For optimal results, cleanse the body with our Sensual Rose Bubble Bath and Shower Gel and finish by smoothing Sensual Rose Body and Massage Oil over the skin during the day to create a boost of sensuality. 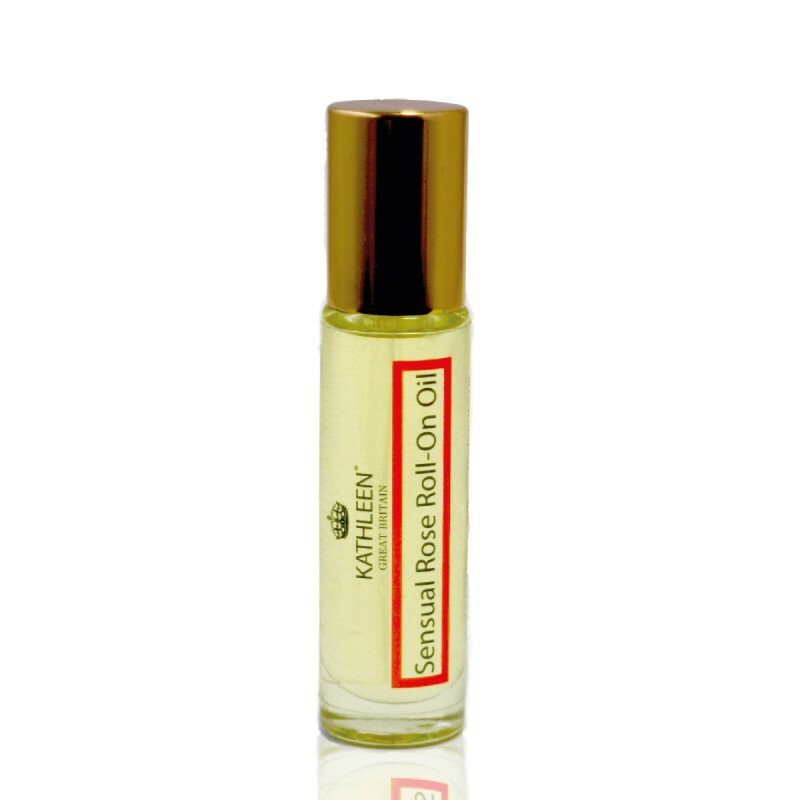 10ml Roll-On natural fragrance oil that fits easily into your handbag, rolls onto pulse points wherever you are. Add a few drops on very dry skin directly and during extreme seasons. To use as a hair treatment, apply 2-3 drops after shampooing to the ends of the hair to bring shine and tame frizz. To treat hands and nails, apply 2-3 drops to massage into hands, cuticles, and nail beds every night. My cuticles are pretty awful to be honest and they’re definitely in need of a pamper. They suggest using the product just before bed to allow it to work overnight. I generally put a couple of drops of the oil on my thumb nail and rub the product across the rest of my nails and rub it in well, I then repeat with the other hand. My cuticles are now in a much better condition and I’m really pleased with the results, I’d actually been photoshopping them in photos because they looked so bad. Once I get out of the shower I then pop the Body Oil on and dry myself. My skin feels so soft and smells amazing, I also feel more motivated in the evening now, as that is when I shower, maybe this combination of scents really does change the way you are feeling. Organic sweet almond oil has excellent moisturizing and protective properties, so apply it after a shower for maximum benefits. It soothes inflammation, dryness, and redness in skin. Its high oleic acid (Omega-9) content allows greater skin penetration and nutrient delivery. It may relieve issues like spider veins and varicose veins. It can be used to dislodge debris from deep within skin pores and follicles and may help prevent future acne because of its vitamin A content. Organic virgin argan oil provides intense conditioning benefits to dry and dehydrated skin and hair. Argan oil has sought-after antioxidant properties, particularly efficient at protecting the skin against premature aging induced wrinkles. It also helps reduce the appearance of crow’s feet. It quickly heals marks caused by scratching the skin and cures skin pimples with a special efficiency for juvenile acne and chicken pox pustules. Organic rosehip oil is full of vitamins (A, C, D, and E) and essential fatty acids known to correct dark spots and hydrate dry, itchy skin, while reducing scars and fine lines. In addition to its effects on the outermost layers of the skin, rosehip oil facilitates invigorating activity on the innermost skin cell layers that produce collagen, elastin, and hyaluronic acid, which are responsible for skin firmness and elasticity. Organic sunflower seed oil is rich in linoleic acid (Omega-6), with important regulatory actions for skin elasticity. It is best for treating dry skin and wrinkles and improving wound healing through its tissue stimulating and regenerating actions. Sunflower oil is the source of vitamin E that defines the powerful benefits for the skin. The vitamin E acts as an emollient and traps moisture inside the cells, keeping the skin hydrated for a longer period of time. Vitamin E is also a strong antioxidant that helps fight against free radicals. Vitamin E oil prevents the formation of wrinkles by blocking free radical damage. It treats wrinkles by boosting collagen production, a connective tissue that keeps skin elastic. Vitamin E oil also treats wrinkles by supporting new skin cell growth and speeding up cell regeneration, which helps with brown spots. Vitamin E oil provides the skin with necessary moisture as well as antioxidants for intense healing.